Travel beyond Tokyo with the JR East Tohoku Area Pass which allows you to enjoy unlimited rides within the East region-Tohoku on Shinkansen. Get free seat reservations and unlimited non-reserved rides onboard the Shinkansen, Limited Express, Rapid Service and local trains. With this pass, you can explore the Kanto area trailing Tokyo, Gala Yuzawa and Nikko all the way to the Tohoku area (Sendai City of Miyagi, Yamagata, Akita, Aomori etc). Catch the "Joyful Train" series where you can ride on the Pikachu train "POKEMON with You"! Enjoy your trip! Your pass can be used on trains and selected buses and ferries across Japan. What is Japan Japan Rail Pass? Japan Rail Pass (JR Pass) is a personal train ticket granting you access to most of the major Japan Railways (JR) train lines. This excludes some of the high-speed trains such as Nozomi and Mizuho Shinkansen. Travellers can get unlimited rides to various locations like Hokkaido, Tokyo,Nagoya,Osaka, Shikoku and Kyushu by utilising this pass. You can purchase them online at https://www.changirecommends.com/japanrail.aspx , at least one calendar day before your collection date (or departure date). It is recommended to get them online. If you wish to purchase a JR Pass directly at our booths, you may do so by approaching our our Changi Recommends booth at every Terminal of Changi Airport (before immigration). We strongly recommend purchasing your pass online for a more expedient experience. I am holding dual-citizenship, am I still eligible to purchase for the Japan Rail Pass? Can I purchase the pass on behalf of a friend who is in Japan? Yes, you are able to order for your friend so long they meet the requirements set by Japan Railways. However, it is recommended that you purchase the ticket for yourself to prevent confusion at the train ticket counter. The pass is non-transferable; it is not possible to activate the JR Pass on behalf of someone else. You must be present in order to exchange the Exchange Order for JR Pass, your passport and identity is used as verification. You can collect your Japan Rail Pass Exchange Order (EO) at any of the preferred Changi Recommends booths, located in across the three terminals of Singapore Changi Airport terminals. The counters open 24 hours daily. Unused Japan Rail Pass Exchange Orders may be returned to Changi Recommends within 1 year from the date of purchase as long as the Exchange Order has not been turned in for a Japan Rail Pass. Stolen, damaged or misplaced Exchange Orders will not be valid for return. Do note that there will be a 10% administrative fee and a 90-day processing time. Customers are entitled to one change of collection date and for any change, please email to attractions@changirecommends.com.sg at least 3 working days before original collection date. If the trip is postponed, a maximum 6 months extension of JR Pass collection date can be requested. Please contact attractions@changirecommends.com.sg for any inquires on refunds or returns in Singapore. You will need to present the Exchange Order for your JR pass at a Japan Rail Office (available in Japan airports and main train stations). Remember to collect this Exchange Order from Changi Recommends before checking in your flight. Can I select the date I wish to use the JR Pass? If I intend to use the JR Pass on 3 Jan instead of 1 Jan, will I be able to use them? You will need to select a date you wish to use the pass when you exchange the Exchange Order for your pass at the JR Pass Office. The JR Pass has to be utilised within 30 days of the exchange. Can I select the days I wish to use my JR Pass? How does it work? Most JR Passes are valid for consecutive days use from your preferred starting date selected on the Exchange Order. The pass remains valid for the given period of consecutive days even if you do not use it daily. Please note however that there are certain passes that allow for flexibility of use within a certain number of days, for example 4 days of usage within a period of 6 days. Validity period of these Japan Rail Passes are counted in full days, not 24-hour periods. For example, using your pass at 9am on day 1 and 8am on day 2 will be counted as two separate uses of the pass. Would my child need a JR Pass? Children of age 5 and below can travel for free with a pass holder, but they are not entitled to a seat. If you wish to secure a seat for your child, you will need to purchase a Child Pass. Children ages between 6 and 11 years old will require a Child Pass. Children above 12 years old will require an Adult Pass. Green Pass is equivalent to first class cabin (also known as Green Car) on all Shinkansen and some of the fast trains. You can locate this carriage with its green clover icon on the side of the carriage. This pass lets you enjoy your journey in comfort with a large reclined seat, ample leg space, integrated radio and luggage space. Unlike the normal tickets, the JR Pass does not work with the automatic gates. Please show your pass to the train staff, in the glass booth next to the gate, for them to let you through. If you are travelling in a group and would like to sit together, we suggest that you apply for seat reservations. Seat reservations are free for JR Pass holders at Midori No Madoguchi. Kindly take note of the peak hours when you are commuting. Peak hours are usually between 0700 hours and 0900 hours, or 1800 hours and 2000 hours. Please be advised that trains can get booked out several days in advance during public holidays such as Bank Holidays. What can the types of trains I can use with my Japan Rail Pass? 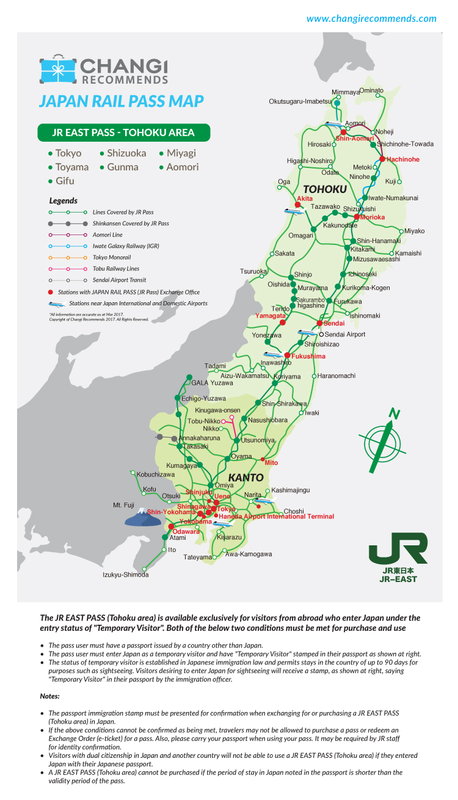 A Nationwide Japan Rail Pass allows you to board on the majority of trains that run on the JR railway network, including regional routes such as JR Kyushu, JR East, JR West, JR Central, JR Shikoku and JR Hokkaido. You will have access to local and express trains, fast bullet trains, and the 'Shinkansen' on the Hikari or Sakura lines. The Japan Rail Pass is not valid for: Private Rail Lines, Super Express-Only Shinkansen trains 'Nozomi' and 'Mizuho', subways or trams within cities, sleeper wagons/ private wagons in night trains, and special compartments for which you will have to pay an extra fee. Absolutely. Please try out the various unique meal boxes from different regional trains. These yummy meals only cost from 1,000 Yen onwards. JR Pass is a tourist-exclusive pass that is only applicable to non-Japanese residents whom entered Japan with a "Temporary Visitor" status. The Exchange Order of the JR Pass is valid for 90 days from the date of issue. To exchange your JP pass in Japan, visit any of the JR offices, located in airports and main train stations. You will need to present the Exchange Order and your passport to redeem your JR pass. The start date of your JP pass will have to be dated within 30 days of redemption. You can only select your seat after turning in your Exchange Order for JR pass. For seat reservation, you will have to approach the JR staff at the Ticket Office in Japan to make the arrangement. Payment will be received upon checkout and not during collection of JR pass. The Exchange Order has not been turned in for a JR Pass. The Exchange Order has not been stolen or lost. It must be the physical copy of the Exchange Order. In any case of returns in Japan, the JR Pass can be turned in at any of the JR Pass exchange offices for a refund, prior to the start date for the use of the pass. 10% of the yen price of the JR Pass will be charged as handling fee.